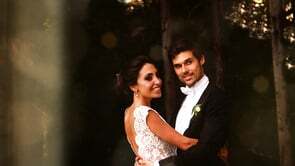 Justyna & Bryan, from Vancouver, chose an extraordinary castle in Tuscany for the celebration of their wedding: Castello di Montegufoni, a stunning castle just a few miles outside of Florence. This idyllic and peaceful place among Tuscan hills was an incredible source of inspiration or us wedding videographers as well! It was a pleasure to film them in every spot of this extraordinary location - the frescoed living room, the spectacular terrace overlooking the Tuscan vineyards, its intimate courtyard and the luxuriant gardens. 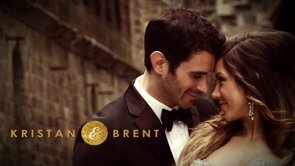 Watching their wedding film you can feel how passionate and sweet Justyna & Bryan were! The soft blush palette in the shades of pale pink chosen for the wedding decor enhanced the romantic and dreamy tone of the whole event. How charming Justyna looked in her bridal dress - her mermaid lace gown with golden wedding shoes was so classy! The surroundings of the castle - the vineyards, a cornfield and an old country house - deserved a “visit” too. We had fun when we involved bridesmaids and groomsmen in the wedding video shooting and the result is quite amazing! Have a look at Justyna and Bryan's wedding film!